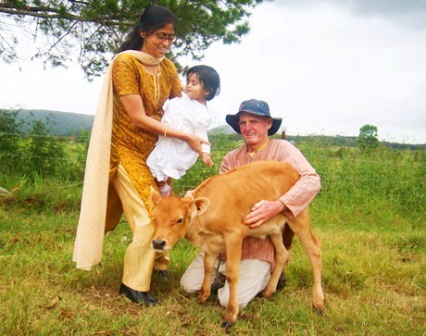 My friend Kaliya Krishna is a cowherd from the Sydney Hare Krishna Farm, New Gokula, in the lush Hunter Valley region. I am indebted to Kaliya and his crew who are diligently trying to set an example of looking after cows and calves with love and affection and making an honest living off the land. Kaliya walks the walk, not just talks the talk. He always has good farm dirt under his nails and smells like a cowshed. How blessed he is! A few weeks ago we spoke about the possibility of my purchasing some dairy produce from the farm, and he informed me that the next time he visited Sydney he would bring me some. That next time was yesterday. 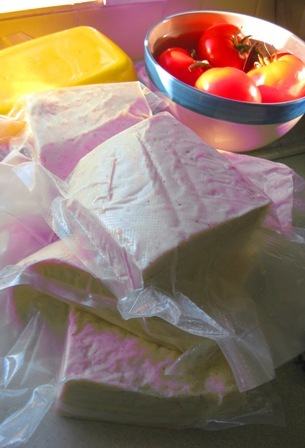 I ordered 10kg of fresh vacuum-packed homemade panir cheese straight from contented cows. How lucky I am! 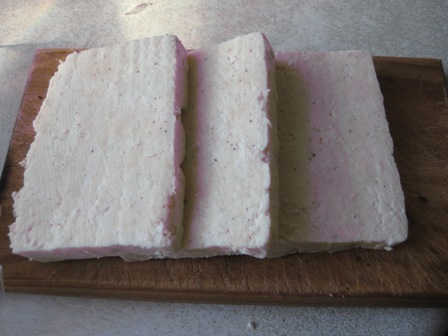 That’s panir cheese made from close to 80 litres of farm fresh milk. These cows will never be sent to slaughter and will be happy to reciprocate with their loving human guardians for the duration of their lives. I also purchased 1kg of the best ghee I have ever tasted. Non-violent, ahimsa dairy products. Heaven! Here’s the mother (cow) lode, resplendent in the morning sunlight. Kaliya told me that since the cheese is vacuum packed it will last in the fridge for a few weeks without the need to freeze. So some of it is now in the fridge, and some is frozen. Obviously it will take me a while to get through it. My son has a friend over for a weekend sleepover, and they wake to find a mountain of vacuum-packed panir still sitting on the dinner table (since Kaliya had dropped of the load quite late, having gotten lost last night in Sydney’s confusing Eastern Suburbs streets). So this morning one thing leads to another, and since the boys want breakfast I decide to break open a pack o’panir and make some quick burgers. Nothing fancy, just with whatever I have. Just the way I like it, as long as I do actually have a store of goodies. Lucky for me I think I inherited my mother’s knack of always having a pantry and fridge full to the brim. It would come in handy if ever a nuclear war struck. 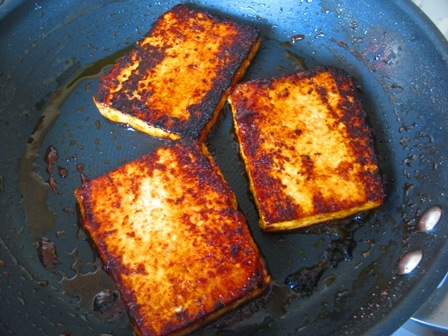 I pan-fry a couple of slabs of the panir cheese in a teaspoon of the ghee with a spritz of asafetida, then splash them with some good quality soy sauce and sweet chili sauce. Always a quick and perfect combination. 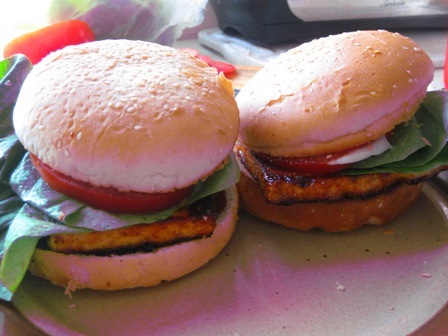 I find two lonely burger breads in the freezer and thaw them out real quick. When you’re cooking for hungry 14 year old boys, you’ve gotta a be quick, and very practical! 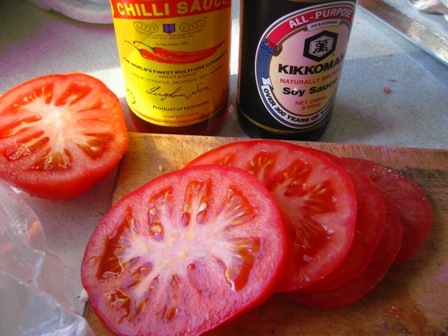 Some fresh lettuce leaves from the garden, and a pretty nice oxheart tomato, a splurt of ketchup and a dollop of some eggless mayo – and there we have it. Hungry boy food. The boys gobble them down in silence (a good sign, methinks) and then they head off for the day doing the sort of things 14 year old boys do on Saturday mornings. Don’t ask.